Planting only two in pots on the patio, they get full sun most of the day and lots of water. Adding some Parsley and a few Marigolds to the perimeters of the huge pots was totally my idea as well as their new location. Last year the pots were located on the South side of the house where most people say there is typically more sun. Not in our yard. The treeline protected them and continues to protect us from the mid-day sun. Last year we had a few. Yes, if you look closely they are almost heart shaped. This variety, known as Oxheart, proved to be a success for us. I've been enjoying my tomato sandwiches daily! There's nothing like a fresh tomato sandwich with a hearty tomato on hearty panini bread smothered in mayo! I just can't seem to grow tomatoes in Texas...I sure wish I could. the heart shape is very cool! A tomato sandwich...the tomato warm from the sun....soft bread....mmmmmm. Is there anything finer than a fresh tomato sandwich? We grow those tomatoes too, they are awesome, and pretty! and the pink red hues are gorgeous. 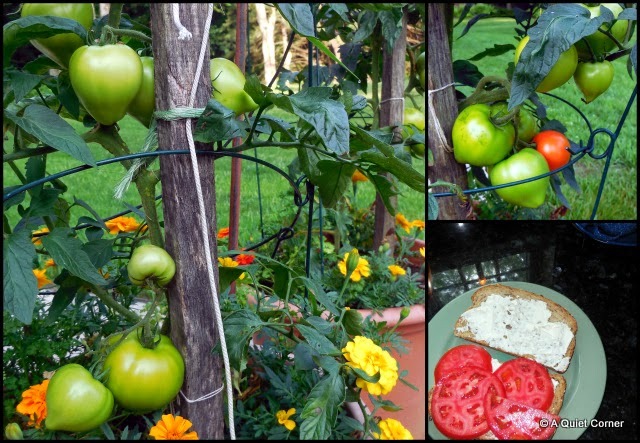 YUM, a fresh tomato sandwich sounds seriously delicious right now. We have some tomato plants that got put in pretty late and we only have a few buds on them right now. I do have a pepper plant on my deck but it doesn't seem to be real thrilled with all the sun it's been getting. Neat heart shaped tomatoes..I love tomato sandwiches.. Yummy! I am glad your plants are doing well. Have a happy new week! Lucky you - my mouth is watering. I do get Heirloom at Whole Foods - delicious! They ARE heart shaped! Straight from the garden to your sandwich, YUM! i love fresh veggies like cucumbers. Mmmmmm. Tomato sandwiches. Mine aren't ripe yet - but it looks like I'm in for a great crop. Oh now nothing beats a fresh tomato from the garden, warm from the sun! Oh yummy...and they do look like hearts!